"If I was a House Republican, I'd be concerned about opposing anything that polled at 63%. And for Democrats, the poll suggests this is an issue you don't want to compromise on." - Damon Silvers, director of policy for the AFL-CIO labor federation following the results of a WSJ/NBC News poll that showed 63% of Americans support a raise in the federal minimum wage to $10.10 an hour from $7.25 an hour. So in listing the pitiful pandering issue of raising the federal minimum wage as one of his top priorities BO thinks he is once again on the right political side of a soft ball topic to cherry pick that he figures will help Democrats in the 2014 midterm elections. As seen above unions are counting on Democrats making the raising of the federal minimum wage rate an issue & they are hoping for Republican opposition. BO includes the wage boost as part of his program to narrow economic inequality – of course this method is intended to bring the top earners down & not help low wage earners as described hereinafter. This post is dedicated to those candidates who know there is more to returning prosperity to America than just promising higher starting wages to the people on the lowest rung of the economic ladder. As usual Democrats take the side seemingly most appealing to the masses with no sense of responsibility for their actions. As always Democrats are interested only in increasing government dependence of the poverty ridden portion of the population that votes Democrat – not increasing entry-level jobs & self sufficiency. Background statistics - there were 3.6 million hourly workers who made the $7.25 an hour federal minimum wage or less in 2012 or 4.7% of hourly workers with half of such workers being between 16 & 24 years old – an obvious entry level age. Only about 10% of those earning the federal minimum wage are heads of households living in poverty. The federal minimum wage began in 1938 as part of FDR's New Deal & was originally set @ 25 cents per hour – had it tracked inflation since then it would be $4.07 an hour today. It has been raised 30 times with the peak inflation-adjusted rate being in 1968. The majority of people who earn the federal minimum wage work in food preparation & other service related areas. Common sense tells us that having the government force the raising of entry level hourly wage rates does not help a business & will not provide an incentive for employers to hire – otherwise why wouldn't businesses do this of their own volition? Last week the Congressional Budget Office (CBO) issued a report that showed there is a trade off when the federal minimum wage is raised from the current $7.25 per hour level to $10.10 per hour (over a three year period with inflation indexing thereafter) – namely, 500,000 people find their jobs eliminated (with a two thirds chance the jobs lost will be from slight up to 1,000,000) but 900,000 people, out of 45 million who are projected to be living in poverty in 2016, are calculated to move out of poverty according to the report. Altogether, 16.5 million workers would see their earnings rise with a $10.10 hourly wage mandate with 8.9 million of them being people who currently earn over $9.00 an hour. Accordingly the CBO report clearly shows that minimum wage hikes involve costs & benefits to society that must be evaluated to determine the positive effect, if any, of the government's forced wage increase on low-skilled workers & the negative effect, if any, it has on the general economy. The people most hurt by raising the federal minimum wage are the most unskilled workers @ the low end of the $7.25 to $10.10 an hour range – people who do not add more to a businesses' revenue than to costs when making $10.10 an hour. Women are twice as likely to fall into this category than men. Teenagers are especially priced out of the labor market by increases in the minimum wage more than any other group - with the biggest cost being their lost opportunity to gain experience & training that they will need later in life. In essence the people who carry their weight @ $7.25 an hour but not $10.10 an hour will be the ones who lose their jobs. But there are other costs to society in raising the federal minimum wage that are not as obvious. Many unions, especially in the service, retail and hospitality industries, peg their baseline wages to the federal minimum wage even when no union member makes the minimum - the average employed private-sector union member earns $22 an hour according to the Bureau of Labor Statistics. Union labor contracts use several methods to trigger increases for their members such as including a formula setting baseline union wages as a percentage above the state or federal minimum wage, mandating a ﬂat wage premium above the minimum wage, or reopening wage talks following any minimum wage hikes. In addition union contracts restrict a company's ability to hire low-skill workers who would gladly work for less than union wages if only to gain experience. All of this adds to the cost of society not readily thought of when politicians want to raise the federal minimum wage under the pretense to help the poor – in many cases it is also payback to unions. These pay increases tied to the federal minimum wage are in addition to other wage increases in the union contracts. Every non-union business & portions of businesses that are non-union face many of the same increases in labor cost principles described for unions above – best illustrated in the following example that shows how relative pay positions are maintained. People who currently make $12 an hour will be demoralized if they do not get a commensurate increase above someone whose wages increase from $7.25 an hour for doing the most menial jobs to $10.10 an hour for doing the same job. It does not take much imagination to see the entire pay scale going up with many people losing their jobs in this example as well as other hiring being impeded. Also, these additional labor costs will produce a commensurate degree of inflation that will eat away @ whatever benefit raising the lowest wage rates ever accomplished. But possibly the most deceptive part of the Democrat's minimum wage charade is revealed by the fact reported by CBO that only 19% of the benefits of raising the minimum wage go to families earning below the poverty level while 29% goes to families earning more than three times the poverty level meaning that the money businesses save from the people who lose their jobs pays for the higher wages of people who are not poor. 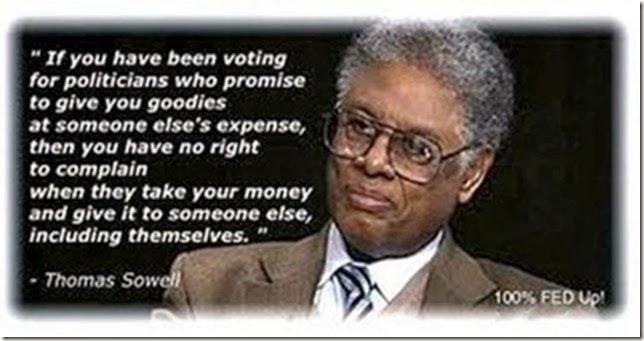 Democrats love to automatically assume the high moral ground by saying Republicans & Tea Partiers abandon the morality issue in not caring about low income people who do not make a living wage – but every bit of evidence I am aware of makes me not trust Democrats & government with morality. All of the above problems accentuate the incentives businesses have to automate instead of hire. This is especially true with the Fed keeping interest rates near zero or even negative in real terms while the government artificially raises labor costs in the faux name of helping the poor. The primary beneficiaries of raising the minimum wage are those who remain employed & have their wages increased in accordance with the new minimum. As with any price floor set above the market determined price an artificially set minimum wage will lead to a surplus of labor – i.e., unemployment. With so few of the people making the minimum wage being heads of households it becomes obvious that federal minimum wage legislation is poorly targeted begging the question – why do we perpetuate this problem? In the face of an issue that polls @ 63% favorable do Republicans & Tea Party candidates want to take on not raising the federal minimum wage? Democrats propose handing low income people a raise of as much as $2.85 an hour while centrist Republicans may put up an argument that jobs will be lost as a result of the mandatory wage increase. Who do you think will win that debate? This is where a candidate for office who envisions the market as the template for all activity comes in. Such a candidate does not place politics over policy & has no use for government's artificial manipulation of issues including raising the federal minimum wage. To be successful regarding this issue the candidate will himself understand the above trade off between lost jobs & higher incomes & can explain it so the affected people understand it also. Reaching such affected people begins the unmasking of politicians who also are beneficiaries of raising the minimum wage in that they get reelected @ least in part by people who think they benefit from the increase – but never really see their lives improve. The candidate will possess the ability to explain that raising the minimum wage consists not just of looking @ the immediate but @ the longer effects of the policy including how the policy effects the entire economy & why the recipients of the current wage increase will fare no better this time than people did from past increases. In essence the candidate will ask if they want to break the mold & participate in a free market economy like America was founded upon? The preceding paragraph describes a tall order but a tall order is required, not just on the minimum wage issue, but literally on every issue in order to turn the country around from the destructive path it is on. Do we see anyone who can lead the country in such a turn around? But we know that BO, MO, Hillary, Pelosi, & Reid are more than capable – they are masters - of continuing the country on the socialist/communist slide. Not raising the federal minimum wage is the ideal issue to reach people to produce a needed mindset change. Start by showing low income people that training & education are their tickets to a better life with potential earnings far above the minimum wage levels. Learn English so a prospective employer can be communicated with. These are two common sense measures that will pay quick dividends. The right mentor can show the smartest (& better yet those with average intelligence & perseverance to accomplish something) of the current low income workers that they don't have to run – they can walk past the untrained competition in ascending the job market ladder. Employers are screaming for properly trained help in far too many fields & can't find them. The stakes are high because the people that need to be reached are part of "Romney's 47%" - people who are dependent on government, believe they are victims entitled to government handouts, pay no income tax, & look @ a raise in the minimum raise as a blessing. These people believe they have a dreadful future with nothing @ stake - they are more interested in looking for their next meal than wanting an economics lesson – & that is the challenge. Without reaching some of them a little @ a time we have an electoral problem that many have started to see – namely, only Democrats will win presidential elections for the rest of our lifetimes. Recently a long time subscriber to RTE, who specializes in sending me such messages, sent a very informative edition of the Heritage Foundation's newsletter The Foundry – Morning Bell that described many of the problems people have experienced with ObamaCare. Although the newsletter was very good I did not think it was as complete an analysis as ObamaCare's Shoes Keep Dropping that was posted on RTE in November. Putting that aside I was very surprised & sorry to see that a significant percentage of the comments to the online newsletter by Heritage subscribers focused not on the ObamaCare points that are in the process of subjecting us to the tyranny of bodily dependence through government healthcare but rather in taking offense that the Heritage writer stated in the newsletter that Social Security & Medicare are entitlements. The offensive language was "Entitlements—like the big three of Social Security, Medicare, and Medicaid—are the biggest causes of America's spending and debt crisis. And ObamaCare creates a new entitlement program while expanding another." How true. I read every comment to the online Heritage newsletter like I usually do in all of these matters because that is how you really get a pulse on what people think. In this case the Heritage subscribers were offended because they had paid into the two programs (without saying how much) over their working lives & resented the word "entitlement." Now I know RTE subscribers know better because I have featured the correct documented answers several times regarding Social Security & Medicare – but here we go again. It is discouraging to think this is the level of understanding of people who subscribe to the Heritage newsletter. Not a good sign for you & me. The Social Security benefit formula is steeply graduated in favor of lower contributions meaning that the program is a partial redistribution of income from beneficiaries who earned high wages to those who earned low wages – i.e., a welfare transfer system. Establishment of each person's Primary Insurance Amount (PIA) is based on their lifetime earnings adjusted to the wage index. The 2012 benefit formula calls for 90% of the first $767 earned, plus 32% of the amount over $767 to $4,624, plus 15% of amounts over $4,624 per month up to the maximum payment. The above benefit formula clearly shows the bias toward lower earners meaning higher earners pay for some portion of the benefits received by lower earners. Two thirds of our seniors depend on Social Security as the main source of their income & for one in five it is the only source of income but paying into the system is not something that in & of itself should make you proud or offended by the term entitlement. Without Social Security half of all seniors would be living in poverty so naturally seniors love Social Security. If possible seniors love Medicare even more. 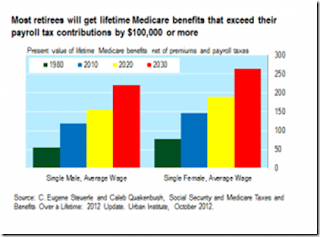 Today's retiring baby boomers are the only people who have paid into Medicare their entire working lives. Medicare Part A is primarily paid for by the 2.9% payroll tax plus co-pays & deductibles paid for by the recipient while Medicare Part B is primarily paid for from funds taken out of the general tax revenues taken from the U.S. Treasury plus monthly premiums & shared co-pays & deductibles paid for by the recipients. The portion of Medicare Part B paid by seniors amounts to only 25% of the program's cost. Medicare Part D is under a similar arrangement as Part B & is 75% funded by the U.S. Treasury meaning that the drug plan constitutes a public subsidy of 75% of the cost of the program. Source Economics Of Social Issues by Sharp, Register, & Grimes. So what's not for seniors to like – except that these programs are not financially sustainable? See above graph from Forbes. How unkind is it for our elected reps to let this continue until total collapse of the programs? It is the elderly & people over 55 who are dependent on these entitlement programs who will be hurt the most when the programs collapse. Just what will these people do then? Accordingly, Social Security & Medicare along with Medicaid form the cornerstone of the American welfare state no matter how many times people claim they have paid into the programs over the years. After the House passed an increase in a clean debt ceiling bill this past week Ringside Reid had no problem envisioning the measure passing into law one way or the other. A simple Senate Democrat majority & BO's signature were assured certainties to raise the debt ceiling until March 2015. So why did TX Republican Senator Ted Cruz filibuster the matter complaining that Congress was raising the debt ceiling without demanding any cuts in federal spending. Of course there were no cuts in federal spending – there never are whether they are written into the law or not – see reversal of military pension cut below. This point has been proven over & over & back in December I had hoped for a truce where the Republicans did not shoot themselves in the foot again like they did with the government shut down in October where they were blamed & the disastrous ObamaCare website launch was overshadowed by the shutdown. It was expected that the hostile anti-American media would egg Republicans on after the House vote with news reports using phrases to describe House Speaker Boehner like "dropped all policy demands" & "marked a retreat." But people like Amy Kremer, chairman of the Tea Party Express, were already incensed enough to say that Boehner & the House leadership must go. Of course Boehner, Cantor, & McCarthy must go for starters as well as all of the establishment Republican Team A described in my letter published in the WSJ on December 28 & is posted on RTE. But why not remove these people quietly in primaries without breeding the atmosphere for Senator Cruz to prove again what a fighter he is. We already know who is on Team B as listed in the aforementioned letter. The fact that some politicians like Paul Ryan switched to vote against the debt ceiling increase will be seen by savvy voters not as a change in Ryan's financially irresponsible position but rather as a chance for him to try to fool unsavvy voters. Thanks to Senate Minority Leader Mitch McConnell's leadership the bill passed the Senate with no further damage done to the Republican Party (or the Tea Party) & in the process McConnell picked up some sympathy – something his Tea Party opponent businessman Matt Bevin did not need because he is already trailing in the primary polls in KY by 20 points. My call for a Republican Party truce @ the end of 2013 did not mean that I wanted the two sides to come together – this could not happen any more than a tractor trailer could fall in love with a goldfish. The point is for the two sides to fight it out in a smart way so that one side prevails without taking the ball off all of the problems the Democrats are having. The worst part to me of this entire above matter occurred twenty five minutes after the debt ceiling measure passed in the Senate when the next vote came up – namely, "An act to ensure that the reduced annual cost-of-living adjustment to the retired pay of members and former members of the Armed Forces under the age of 62 required by the Bipartisan Budget Act of 2013 will not apply to members or former members who first became members prior to January 1, 2014 . . ." In essence this bill according to Fox News was going "to restore full cost of living pension increases for younger military retirees, completing a bipartisan capitulation to veterans groups that rose up against a modest cut when it was enacted less than two months ago." The rub is twenty five minutes after Cruz's debt ceiling theatrics that were initiated because he thought Congress had not cut spending regarding the debt ceiling matter Cruz voted to restore a significant portion of what little spending Congress did cut in December bringing into play his entire motives & agenda in both recent filibuster attempts he instigated. The vote was 95 to 3 with two not voting (Chambliss R-GA & Coburn R-OK). The three voting Nay were Carper (D-DE), Coats (R-IN), & Jeff Flake (R-AZ) who for years was the most financially responsible member of Congress when he was in the House. "Year after year members of Congress simply refuse to stick by the budget discipline that we said we'd stick to. Exhibit one is before us today. . .When deficit reduction measures get signed into law, surely at some point we need to stand by them," said Senator Flake. The rest of the Senate was no where to be found clearly afraid of the clout of veterans groups – particularly in an election year. Given the choice I would much rather have had Cruz stick with Jeff Flake on the military pension vote than start another filibuster. But Senator Rand Paul's filing of a class-action lawsuit in the U.S. District Court in DC against BO's administration, Director of National Intelligence James Clapper, NSA Director Keith Alexander, & FBI Director James Comey has all the potential to be an even more serious blunder than the Cruz filibuster. Senator Paul was joined in the filing by Freedom Works who said they filed the lawsuit for themselves & on behalf of "everyone in America that has a phone." The lawsuit calls for an end to the bulk mass collection program of the National Security Agency (NSA) – which is authorized by Section 215 of the USA Patriot Act - of millions of American's phone records because it violates the Fourth Amendment right against unreasonable searches – & of course it does. The problem is that Rand Paul's lawsuit could easily turn into one elected branch of government suing the other elected branch with the possibility that five of the nine Supreme Court Justices will decide a matter that should never come before them – a thought that would make Alexander Hamilton turn over in his grave. The Republican National Committee has already approved a nonbinding resolution to end the NSA program in agreement with Senator Paul's position. Also, there are intra-party tensions because many Republicans support the NSA program for security reasons – just what Republicans don't need is another high profile squabble. Lead council for Senator Paul & Freedom Works is Ken Cuccinelli who said that "this is a constitutional challenge primarily, we're not debating national security policy." Cuccinelli was the first attorney general to challenge the constitutionality of ObamaCare & was recently defeated in the gubernatorial race in VA so his recent record is not good. Just like the detestable ObamaCare decision that resulted in the Supreme Court (Roberts) saying that ObamaCare is constitutional in their opinion the Paul case has the likelihood to have a similar result with the Supreme Court deciding that the NSA program is constitutional. Then we have another terrible decision that should never have been made by the judicial branch of government & one more dangerous legal precedent establishing this non-elected branch of government as supreme over the other two. People have come to take for granted that the Supreme Court is the only & ultimate source for determining whether or not something is constitutional. This is one of the biggest mindset changes that is needed & when both elected branches run to the Supreme Court for decisions regarding matters they have no business deciding it undermines the Founders' intentions & takes away our liberties. Please make no mistake that raising the debt ceiling & the unconstitutional NSA program are major problems facing our Republic. Congress - the peoples' representatives - has many ways to solve these problems & the best is to enact new laws. But this will require winning elections & the most desirable way to do this is to present to the electorate tried & true principles for restoring prosperity & raising the standard of living – things that are sorely missing today. Now I generally back Ted Cruz & Rand Paul but filibusters with no chance of winning your intended point & taking lawsuits like the one above to the courts are political losers that will not help turn the country around. In fact they are amoung the best ways to ensure that elections will only be won by Democrats. Kelly Markson, Cary, NC: "Mr. President, reducing income inequality appears to be a cornerstone of your administration. Is the poverty of a single mother related to the salary of the CEO?" Jim Pallito, Hazlet, NJ: "Why do you focus so much, Mr. President, on income inequality when the real issue is intellect inequality?" Cory Rohrbach, Hamburg, PA: "With all the entitlements we have today, what ever happened to JFK's words: 'Ask not what your country can do for you.'" Kathy Lemaster, Fresno, CA: "Mr. President, why would you want to fundamentally transform a country that has afforded you so much opportunity & success?" Now as good as the above questions are, as well as the ones sent to me by the RTE readership, the interview was set up for BO to win. About half way through the live interview on Sunday I realized that BO was winning the all important likeability contest. BO was smiling & Bill had a pale tough high school vice-principal look on his face. People were getting ready for the party of the Super Bowl & Bill was asking about murders & firing someone that most of the audience had no idea who he was talking about. BO did not answer any question factually accurate but rather repeatedly used the tactic of irresponsibly denying the reality of the major problems Bill presented & I think the audience who was ready for a party could not have cared less. The one part many in the audience may have picked up on was when BO said speaking of Bill's questions "these kinds of things keep on surfacing because you and your TV station will promote them," thereby continuing the war against FNC in a very sneaky way that Bill picked up on. The Washington Post fact checker will run out of Pinocchios for BO on this one. Monday night Bill went over all of the facts & corrections on FNC & his audience of a few million people will care - the other people will just be getting ready for their next party. Under the pre-Super Bowl venue the interview was set up to fail whatever Bill asked & the harder Bill pressed the worse it would have looked. BO knew all along he was playing a winning hand & this will only embolden him going forward. One of the first rules of public speaking is to know your audience & BO sure knew this one. Democrat strategist Mary Ann Marsh told Bill in 2012 to never underestimate the likeability factor. I always look for this because I think she is right. It carried the day on Sunday for BO & also in November 2012 with the declining intellectual capacity of the American people. Although virtually every one including me looked forward to the interview I think the venue is entirely wrong if the goal is to make a definitive event of substance out of the questioning. This would be so much better done in a press conference if the members of the hostile anti-American media were @ all interested in preserving the American Republic. Click here to see the results of Gallup's annual study of political trends in the U.S. on a state by state basis. Overall, Americans were much more likely to self-identify as conservatives than as liberals in 2013, though that gap continues to shrink from previous years. People like Sean Hannity love to say America is a center right country & I don't believe it – how could a center right country elect BO twice, a Democrat Senate, a House with Nancy Pelosi as Speaker, & a current small Republican majority in the House most of whose Members are not conservative? A study of the Gallup website above will show that the answer is in the number of people who classify themselves as moderates. My own experience & observations are that moderates are much more likely to vote Democrat than Republican meaning they actually are Democrats. For example (believe it or not) NJ is +3.1 more conservative than liberal (29.6 – 26.5) but has 38.9% who self identify as moderate. Conservatives cannot win state wide in NJ because the relatively low 29.6% level of conservatives is too low a starting point for the rest of the electorate to be able to overcome the hurdle to get to 50% to ensure victory – Steve Lonegan recently lost his Senate bid totaling 44% of the vote which is the level conservatives max out @ in NJ. SC starts with 45.1% conservatives so the hurdle to get to 50% is much easier. Before any one asks - Christie got 60% of the vote against a very weak opponent & Christie is no conservative. Do your own analysis of your state & you may get a different political insight into what is happening there. Gallup has conducted a State of the State study every year since 1992. In 2013 it had a random sample size of 178,527 adults, aged 18 & older, living in all 50 states & DC so a lot of work went into the study. Hope you enjoy the website but more importantly I hope you learn something of value from it.